​​​​While there had, and has, been blowouts in Super Bowls other than the twenty-fourth version, the hammering the Denver Broncos took at the hands of the San Francisco 49ers had not been witnessed previously, nor has it since. San Francisco took control of the contest from the very beginning, taking quarterly leads of 13-3, 27-3, 41-10, and the final tally of 55-10. 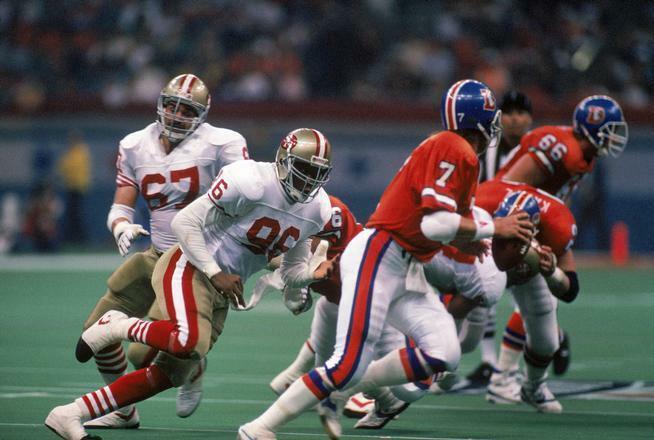 Right from the start, the 49ers took advantage of the Broncos' secondary's preference for "hitting" rather than "tackling" - and with it came several scores whereby the receiver had bounced off the Denver defender, including Montana's opening strike to Jerry Rice. 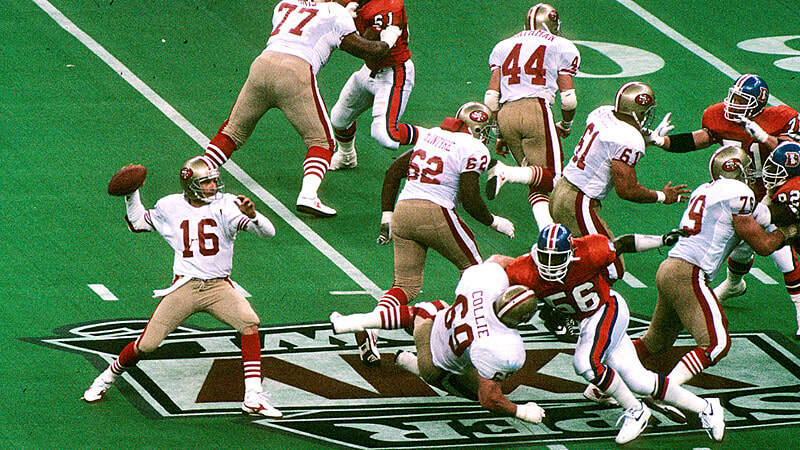 Following an interception of John Elway to open the second half, this was demonstrated again by San Francisco, as they went straight to Jerry Rice, who again, bounced away from the would-be tackler. Montana would outdo his previous year's performance, at least in terms of statistics, as he completed 22-of-29 pass attempts for 297 yards and 5 touchdown strikes, while also sitting out the majority of the final period, giving way to (then) back-up, Steve Young. By comparison, John Elway completed only 10 of his 26 attempts for only 108 yards and 2 interceptions, although he did score the Broncos only touchdown on a scramble in the third period. 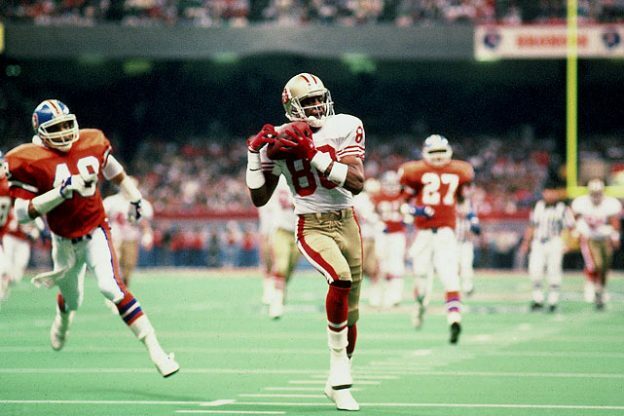 49ers' WR, Jerry Rice, on his way to the end zone for one of his three scores. 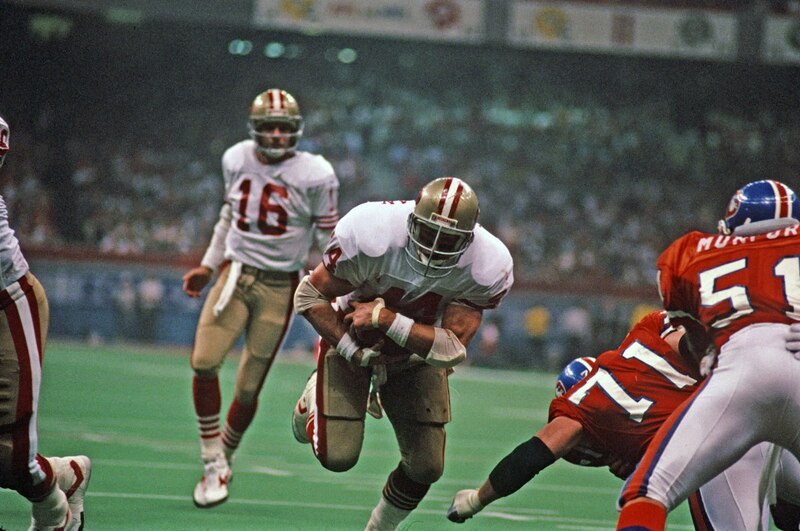 Super Bowl XXIV was the San Francisco 49ers second consecutive Super Bowl victory, and their fourth of the 1980s. Like the Steelers the previous decade, there is little doubt that the 49ers are THE team of the 1980s. The 55 points scored by San Francisco marked the largest total ever put up in a Super Bowl game, as well as the largest margin of victory. 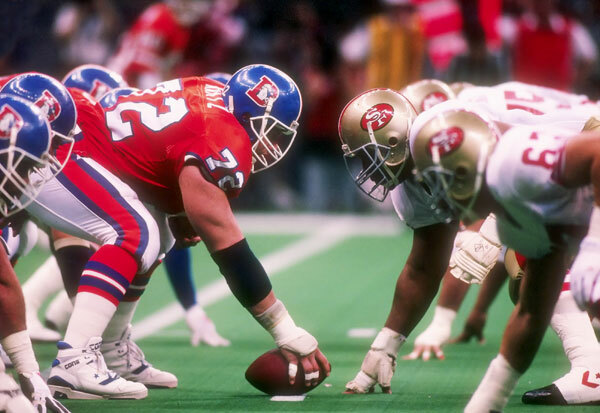 Although the 49ers' drubbing of Denver is a masterclass in offensive perfection, it was ranked as the lowest of the first fifty Super Bowls. You can read more about that here. 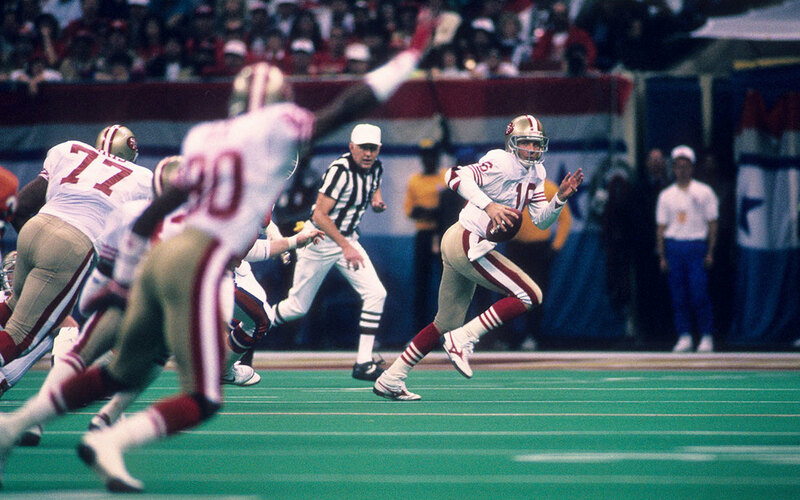 Although 49ers' quarterback, Joe Montana, earned the MVP award, wide receiver, Jerry Rice had another great big game performance, catching 7 passes for 148 yards and 3 touchdowns. Incidentally, his three scores marked only the second time a player had scored three times in a Super Bowl (teammate, Roger Craig, score three times in Super Bowl XIX). Incidentally, Roger Craig spent the days leading up to Super Bowl XXIV suffering from the flu, at one point, missing an entire day of practice and losing significant weight. He still played a key roll in the victory, however, carrying the ball 20 times for 68 yards and a touchdown, adding a further 34 yards off the back of 5 receptions. Former head coach, Bill Walsh, is said to have said after the opening moments of Super Bowl XXIV, "This game's over! Everyone's open!" 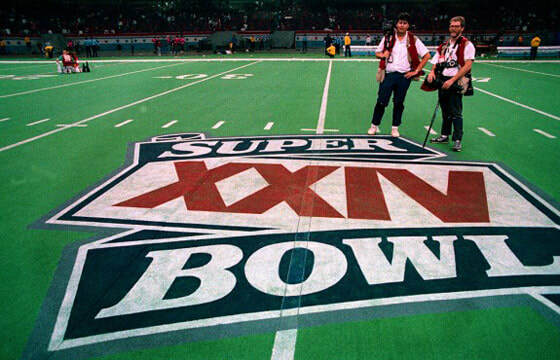 The Silver Anniversary Super Bowl is perhaps best remembered for two words, "wide right!"